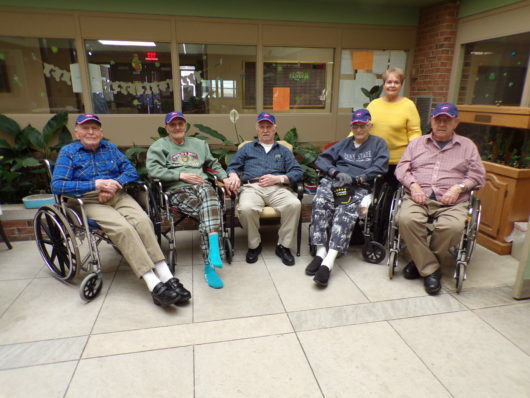 VFW AUXILIARY PRESENTS HATS TO VETERANS – The VFW Auxiliary recently presented hats to veterans who live at Guy and Mary Felt Manor and thanked them all for their service. Shown are Ron Blauvelt, WWII; Fran Agliardo, WWII and Korea; Tom Wilk, Korea; Art Clark, Korea; and Ed Tartaglia, Korea. Not pictured is Steve Nadji, also a veteran of the Korean War.